I have been cleaning out my closet over the last couple of weeks. And, boy did I find a lot of forgotten "stuff". One of the things I found was this little blanket. I had bought this to put in Miss A's room when I redid it. to dress it up a bit. So, it got put back and totally forgotten. When I found it I decided no better time than now to finish it. I think it really dresses it up. to dress them up a bit. I have done this to several we have here. of it for my base. 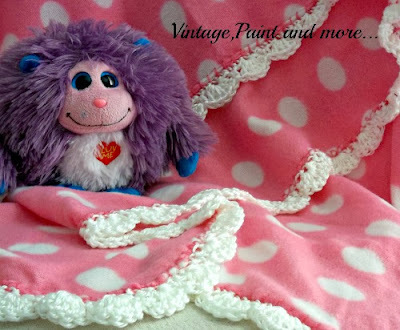 I have just crocheted each stitch in the stitches of the blankets edge. Also this is a pattern I made up in my head. I start by attaching the yarn in a stitch anywhere except a corner. I then single crochet in each stitch all the way around the blanket. I do this by making two single crochets in about every third or fourth stitch. This will be different for each blanket. chain one and single crochet in same stitch. do a single crochet in the next single crochet. Then repeat this pattern all the way around. 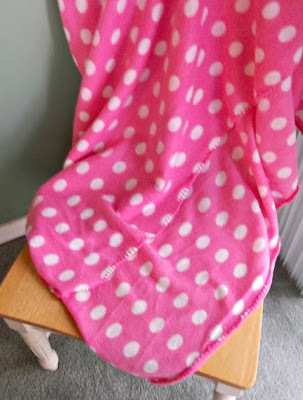 on one of these plain fleece blankets. The blankets are quite inexpensive and the pattern is simple. It took me all of two hours to do this whole blanket. Think you might want to make a couple of these for Christmas gifts? then punch your own holes. I have made several this way also. I just use a plain old paper punch. But, when I want a certain look or pattern I have done this. It still is quite simple and can be finished in an evening. on it to keep you warm this winter. That is funny about not wanting to crochet in the summer. I did so many crocheted edges this past summer. I do a lot on napkins because the edging just makes a plain napkin look so special. 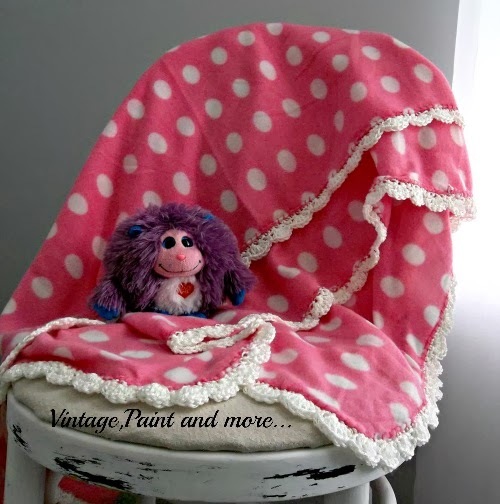 Love your polka dot blanket. What a difference the little crochet edge makes! So cute! Thanks for sharing at TTF! 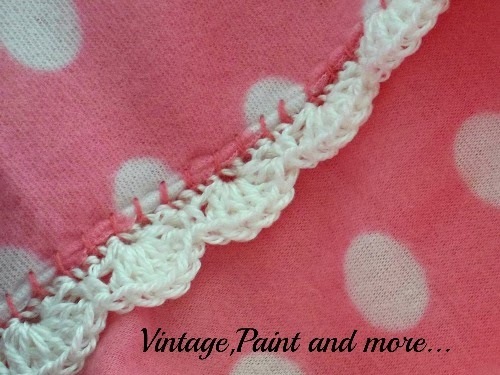 Cathy, the crochet edge adds such a sweet touch to blankets. I have a friend that makes a lot of these. I need to try crocheting again. Tried when I was a newly wed and did it way too tight. Thanks for sharing with SYC. I LOVE this!!! Thank you for sharing at our TGIF Link Party at A Peek Into My Paradise. I hope you will be back to link up another awesome post this week! Adding that pretty edge adds a sweet vintage look! I am also not a fan of crocheting in summer. 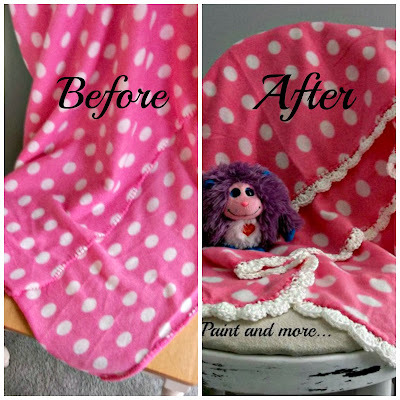 The whole thing is just too hot and you shouldn't sweat while crafting on the sofa :) The edge adds so much and I love the polka dots! Thanks for linking up at Link It or Lump It this week!